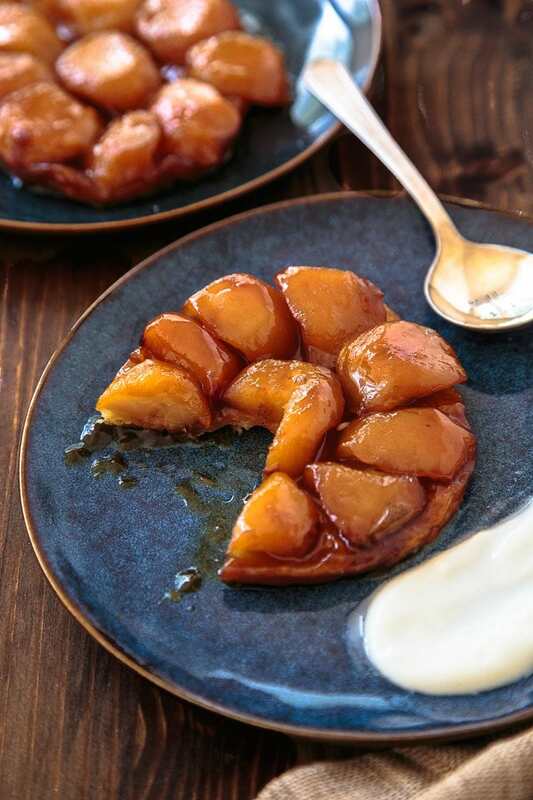 Apple Tarte Tatin for two in two mini cast iron skillets! I know. How French of me. I’m really enjoying sharing my obsession with you. I’m also having a bit of a moment with simple French cuisine. It’s been easy lately, because simple recipes require high quality ingredients, and my CSA is churning out some serious good stuff this time of year. I love the late summer/ early fall harvest. This is my first week with local apples, yet I’m still getting pints of sungold tomatoes. I can’t think of anything better! Ooh, except fall’s first kale and summer’s last zucchini. No no no, how about the first acorn squash with a heavy, ebony eggplant? The eatin’ is goooooood lately. 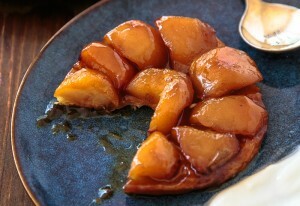 After I properly remedied my crêpe-less life last week with Crêpes for Two, I knew Apple Tarte Tatin was next. What I did not know is how easy it is! 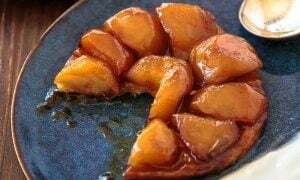 Apple Tarte Tatin is basically apples cooked in caramel with a sheet of puff pastry on top. Easy, right? And since you’ve all made my 15-minute puff pastry recipe, you are more than ready to make Tarte Tatin with it! 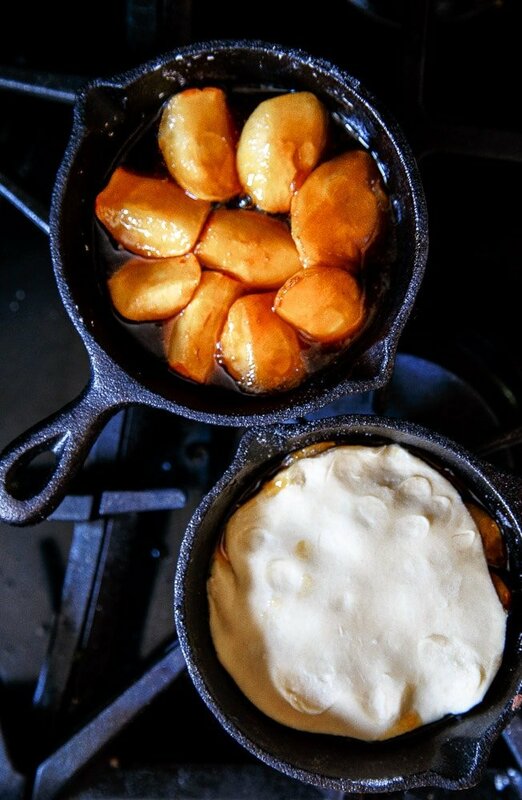 I made individual Tarte Tatins in two mini cast iron skillets. My skillets measure 5″ wide and 1″ deep. Please measure before using. I had a long email exchange between a reader who had countless failures making my Chocolate Chip Cookie Sundaes with the wrong size cast iron skillets. When we finally figured out her mini 3″ skillets that were only 1/2″ deep were the culprit, we were so relieved! So, grab your ruler and measure your mini skillets first, ok? I should mention I didn’t test this recipe in any alternative size pans, because these are just so cute. But, since the recipe is pretty simple, as long as your vessel holds the apples with at least a 1/2″ space below the rim in order to stuff the puff pastry, you should be good. Don’t quote me on that, though. I cooked my apples in a separate skillet first, obviously. I didn’t want to catch on fire while wielding two mini cast iron skillets over 10″ gas burners. Plus, I’m really into these fall baggy sweaters (with skinny jeans! ), which are highly flammable. Not that I learned by catching my sleeve on fire while making chai last year or anything. Not at all. So, my friends. Think of this as an even easier, all American apple pie, with a French twist. You can do it! These are the exact mini cast iron skillets I used. Have ready two mini 5" cast iron skillets that are at least 1" deep. If they aren't seasoned very well, rub a bit of butter inside the pans. First, make the half-recipe for puff pastry, then cover the dough and chill. (Click on the link in the ingredient list for the recipe). Next, peel and core the apples. Slice each apple into 6 equal-sized lobes. Set aside. In a small 8" skillet over medium-low, add the sugar in an even layer. Let the sugar melt without stirring until it's bubbling and fully dissolved. Keep an eye on it, it can burn! To evenly distribute the sugar during cooking, tilt the pan gently--do not stir with an implement. If any sugar crystals get on the edge of the pan and won't drop back down, use a pastry brush dipped in water to nudge them back in. 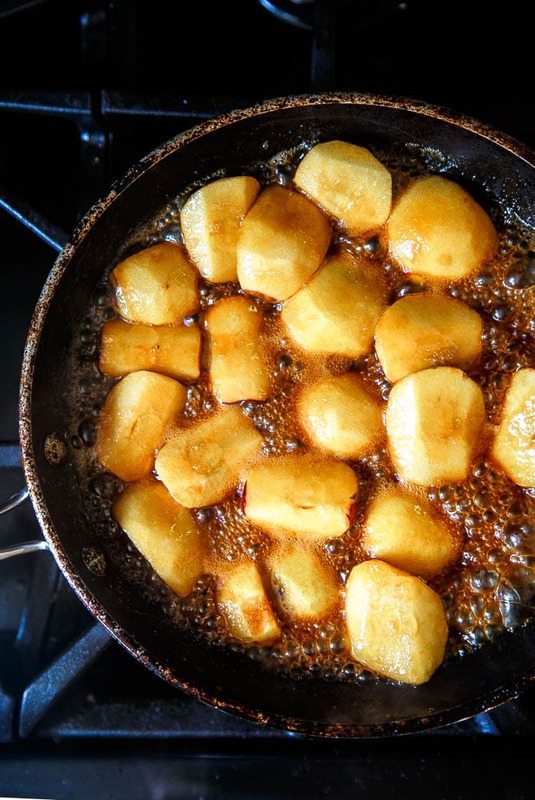 Once the sugar is turning a light golden color, add the butter a few pieces at a time. Be careful-it will splatter! Once all of the butter is incorporated, add the apples to the pan. Cook the apples in the caramel sauce, while stirring occasionally, until the caramel turns a deep amber brown. It will thicken to the consistency of maple syrup. Remove the apples from the pan (reserving the caramel sauce), and arrange them prettily in the cast iron skillets, cut side up. Use one piece in the center to 'anchor' the design, and arrange the slices around. Cram the apples in tight, they will shrink as it bakes. Next, to the reserved caramel sauce in the pan, add the salt and lemon juice. Swirl to stir. Pour this mixture evenly over the apples in the skillet. Next, remove the puff pastry from the fridge and flour a surface. Roll the pastry out to get 2 6" circles of dough. Cut out the circles, and move them to the skillets to cover the apples. Tuck the excess pastry down towards the bottom of the pan. Move the skillets to a small baking sheet, and bake for 20 minutes. When done, the surface of the puff pastry should look dry. Let the tarte rest in the skillet for 5- 10 minutes. Then, place a serving plate on top of each, and using oven mitts, flip the skillet to turn out the tarte. If any apples slide around, move them back into place. Use the smallest, squattest apples you can find. Organic apples are usually pretty wimpy in size, but big on flavor. Love these little skillets. This is such a tasty recipe and is the perfect fall treat! Perfect! Your recipes are great for semi empty nesters too!!!! Hi! I just wanted to check if the 5″ measurement of your mini skillet is the top part of the skillet or the bottom part, as the link for the exact ones you use leads to various sizes so I’m not sure if it’s the 3.5″ option or the 6.5″ one. Thanks very much! Please ignore my comment on sizing! I’ve figured it out! Thanks! Same question as above- please confirm the 6.5inch skillet is the one to buy. Thanks!